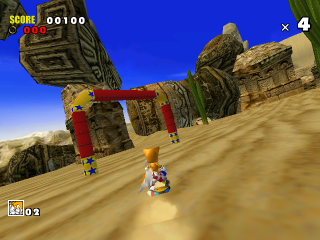 Sand Hill is a Sub Game in Sonic Adventure which appears in Tails' story shortly after Sonic and Tails' stories diverge after Sky Chase Act 1. It is located off the left path in Mystic Ruins' jungle area. 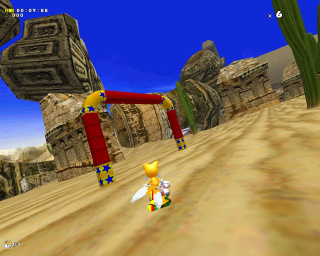 Tails enters this level after meeting Froggy for the first time, who had swallowed a Chaos Emerald Tails had found to power the Tornado jet, which had just crashed. Tails' goal in playing the level is to reach the end and catch Froggy. Because Sonic and Tails share so many of the same levels, Sonic can also play this level once Tails has unlocked it in his story mode. Additionally, Sonic can play it in Adventure and Mission mode, but because he can't easily reach the access balcony in the Adventure Field, it is generally accessed through the Sub Games menu in Trial mode. A properly-timed Super Spin Dash can reach that area. Unlike with other characters, the switch to gain entrance to the level does exist and is functional for Sonic. Sand Hill is very similar to Ice Cap in that Sonic or Tails sandboards down the hill. However, Sand Hill contains one very large area where one of a number of paths can be taken. As a Sub-Game, Sand Hill has a scoring method which consists of goalposts along the paths that should be passed through. When you pass through each one, you gain points, and passing through another one quickly enough adds one to your score multiplier. In order to reach the second Emblem target score, you have to maintain a combo for most, if not all of the level. In some areas, this is difficult due to the obstacles in the path, turns and dips, and a large distance between goals. This page was last edited on 26 August 2018, at 13:23.